Cavalia Returns To Boston Area With "Odysseo"
The internationally acclaimed Cavalia pushes the limits of live entertainment once again with its second production -- "Odysseo" -- a 30-million dollar extravaganza that's wowing critics and audiences alike across North America. Cavalia’s "Odysseo" will make its New England premiere in the Boston area on Wednesday, August 7. The exclusive engagement will take place under the White Big Top at Assembly Row in Somerville, at the intersection of Interstate 93 and Route 28. With its latest creation, Cavalia marries the equestrian arts, stage arts and high-tech theatrical effects to present an ode to horse and man. "Odysseo" features 67 horses and 46 artists in a larger-than-life production imagined by one of the cofounders of Cirque du Soleil. Headquartered in Montreal, Cavalia Inc. operates two separate touring shows, "Cavalia" and "Odysseo." "Cavalia," seen by some 4 million people across North America and Europe since its 2003 debut, celebrates the relationship between humans and horses by loosely recounting the evolution of this bond. 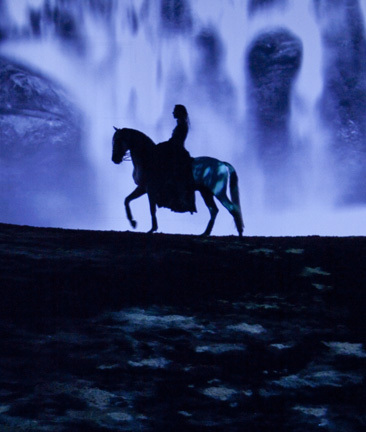 "Odysseo," which premiered in autumn 2011, takes the next step, leading viewers on a journey through some of the breathtaking landscapes horses have helped humans discover around the globe. For tickets and information, call 1-866-999-8111 or visit www.cavalia.net. For those seeking a complete evening, the Rendez-Vous package offers superior seating, exquisite buffet-dinning before the show, an open bar, desserts during intermission plus an exclusive visit to the stables after the show.